I hope you're all enjoying your Memorial Day as we remember those who've served our country. 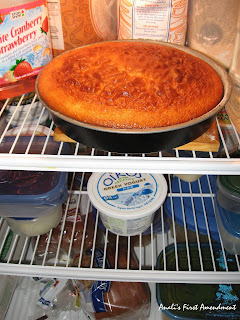 I finished baking a cake and it's cooling in the fridge. After I make a pasta salad, I'll be getting ready to pick up my brother, then we'll be headed to my parents' house for a visit and a nice meal. Even though I moved out of my parents' house decades ago, it's still says "home" to me. And it's nice to be able to go home again. I'm sure that those who are serving in the military abroad are eagerly anticipating their return home too. The concept of home and what makes someplace home is something that I've pondered often since I was a child. I've always loved The Wizard of Oz and remember Dorothy's magical words "There's no place like home." The people at Stonyfield Farm understand that there's a powerful tie between food and home. OIKOS is Greek for house, household, or family. 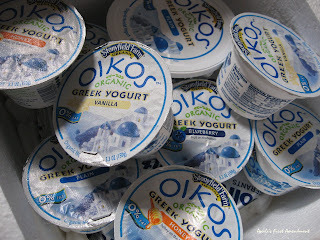 And OIKOS is the name of their new Organic Greek Yogurt. I was contacted by Stonyfield Farms and asked if I'd like to try their new Greek style yogurt. I had never tried this type of yogurt before, so I eagerly awaited the overnight yogurt shipment. They gave me a large variety of their Greek yogurts, which I happily ate straight from the container and used in baking. Greek yogurt is smooth and creamy. Click here for coupons and try it yourself. The only bad thing that I can say about this yogurt was that I had a problem finding it in the grocery store. Hopefully you won't have that problem! Over the next week or two, I'll be sharing more recipes and information with you. For now here's the cake recipe. I have to head out of the house! Oil and flour a round cake pan. Set oven to 350 degrees. Combine ingredients in a medium bowl. You may want to use a large whisk to make sure the eggs are well incorporated. Pour the batter into the prepared pan and bake for about 35 minutes. The cake will be well browned. Cool and serve. I'm assuming this is really good, but I haven't tasted the cake yet. Only the batter. Which was quite tasty. You may want to top the cake with a bit of whipped cream, some fruit, or a simple vanilla glaze. I think this will taste just fine plain though. Enjoy! You know I am going to have to try this one--gluten free, of course! Where do you find honey whiskey? I've heard of mead (sp?) (FIL made it one time from the honey from our family's bees), but not honey whiskey. Of course, I'm sure I could use Kahlua, Grand Marnier, or soemthing else. It looks wonderful! shirley - I bought a bunch of mini bottles of liquor to try in my baking. I just grabbed the bottle to look at. Reading from the label it says "Wild Turkey American Honey." The description then reads " exceptionally smooth liqueur blended with pure honey and bourbon whiskey." I only have about 2T left though. The bottle is so small that I can barely read the really small print. The bottle is 50 ML, which I think is just under 2 ounces. lynn - Welcome! I hope you try the recipe. girl, you are making me hungry here in France- will try your recipes! tonoc!!! have a supper day!